The "man in black" is going postal - officially. 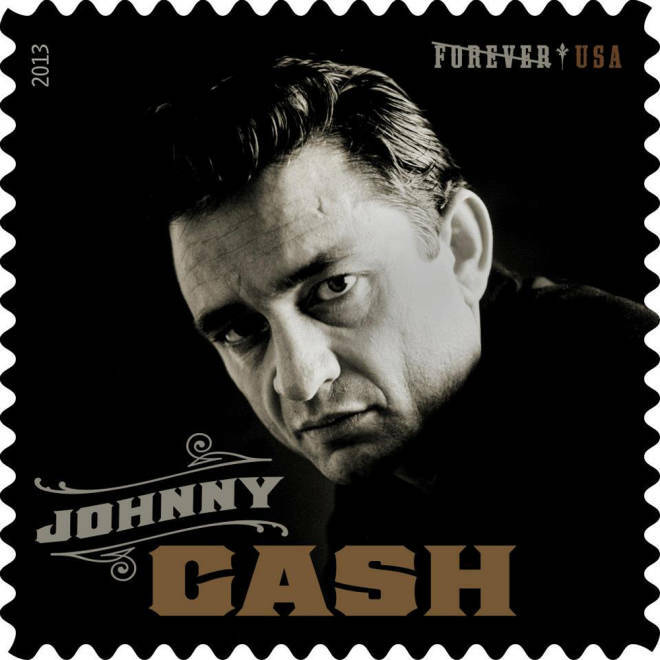 The United States Postal Service has announced that a Johnny Cash stamp will be issued this year as part of its new "Music Icons" series. According to BeyondthePerf.com, a web extension of the USA Philatelic catalog, the stamp is meant to resemble a 45 rpm record sleeve. The black-and-white portrait of Cash featured on the stamp was taken by Frank Bez in 1963, during a photo shoot for "Ring of Fire: The Best of Johnny Cash." USPS representative Mark Saunders said that Cash is the first of three performing artists announced in the series. The other two will be revealed later this year. The process for selecting topics for its stamps can be a long one for the USPS. "We get about 40,000 suggestions for stamp ideas each year but only about 20 topics make the cut," Saunders said. "These suggestions are reviewed by the Postmaster General’s Citizens’ Stamp Advisory whose role is to narrow down that 40,000 to roughly 20 and then provide their recommendations to the Postmaster General for final approval." Johnny Cash was active in the Nashville music scene for nearly five decades, beginning in the 1950s. It was his rendition of "Ring of Fire," co-written by wife June Carter Cash, in 1963 that helped make him a crossover hit. The single reached No. 17 on the Billboard 200, and stayed on the charts for more than a year. Johnny Cash was inducted into the Country Music Hall of Fame in 1980 and the Rock and Roll Hall of Fame in 1992. He died of complications due to diabetes in 2003. A release date for the stamp has not been announced.